Ki ora, welcome to my new vastly improved website. Many moons ago I had a blog, I wrote about every race and experience from my first European ventures as an 18 year old right through to my first year pro, unfortunately the blog was eventually ran out of town by twitter. I've always said I hate twitter, but I was eventually conned into it during my time in Radioshack and although I still dislike it, or the concept that everyone needs to post about everyday life events, taking people out of the moment and into a strange fake online world where things are based on perception over experience- I have realized it’s a very powerful weapon and in the case of a gypsy like myself, it helps mum know what country I am currently in. The other thing that stopped the blog was the fact that it was a blog, every under 17 bike racer under the sun has a blog, but now that it’s a website I guess it can be called an update….so put the jug on because the first one is lengthy- let me update you. So what’s new? Well almost everything, I'm all stitched up in a new green outfit and parloing some italiano. I won't try to bridge the gap between the last posts and now so I'll start fresh. 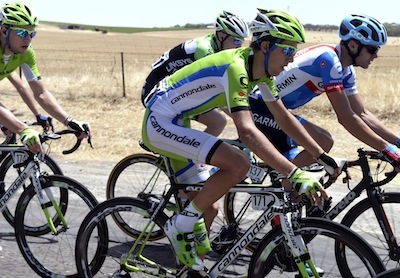 Essentially it's 2014, I'm riding for Cannondale pro cycling and I'm changing a lot . 2014 is young - for most in pro cycling it hasn’t even started - so far it hasn’t been the dream start I hadn't planned but hoped for. Last season, I hit November and December hard and lit up the National Champs. I went on to have a good show at Tour Down Under and kept the acid on through March and then completely shat the metaphorical bed before the Giro and crept the whole way to Brescia. So this year we (me) decided to cool the jets a bit and naturally through a series of events (finish in Japan Cup 22nd October - needing a break and then spending a month in Europe to get acquainted with my new amigos in green), I was already on the back foot missing a solid block of Kiwi Summer pedaling, so the only thing to do was run with it and set the goals further down the road. Being a pro cyclst requires a certain amount of internal irrational arrogance and come race morning, you don’t think about your poor build up, all you care about is winning the race so when you get smashed in the NZ nationals and finish well out the hoop - it hurts. I think the worst thing about it is the expectation, maybe from yourself or others or whatever it is, but I think its impossible to race till nearly November, have a rest then be good in January and keep hissing the whole season. After a day or two I decided to stop the comparisons to 2013 and take the loss at nationals with a grain of salt and move on to TDU. The week between Nationals and TD'U I thought I might have stumbled on some form, and I had - but its sporadic form and very strange. Not the bombing form you have after multiple hard weeks of miles, strength, intensity and racing but the “one year older, one year stronger” moments where I would smash power records significantly. I put about 25 watts onto a session of 8 x 3.30min hill reps, which I thought was massive - I kind of assumed my power meter was tripping out but after a replacement power meter I did the same session again and it was still the same. Average powers and controlled intervals where all up but as soon as I hit the race with the varying power, the sprints and the long intensity my lack of training got very exposed. I knew in the first stage at TDU I was in trouble when we hit the climb after a crazy run in, I thought it was difficult, but there was still 70 guys left. If I was going to get my top 5 in the overall well….well I guess I just wasn’t. The old confidence took a bit of a hit, and this I have discovered is so much more important than you would think, it's hard to know if it comes from the fact you're riding well and you're strong so generate confidence? Or you have trained really hard so you are confident in your training and you start riding well? Either way cycling can be a head game, and the roundabout point I'm slowly getting to is this; Last year in this period I trained really hard, had confidence in my training and a big mental focus on this period of the year; This year I have physically stronger legs after another year in the pros, but have trained less and placed far less importance on this period of year, and although I could expect the results to be a little bit less physically, the fact I was off the pace by a little and not racing for the win or to help a team mate win equated in far larger gap in performance that can't be explained by physical differences. I came to TDU as a co captain of the team, we brought a really young team with a few neo pros and a great sprinter Vivani. In cycling people talk about taking your chances to lead, in the race I got every opportunity to have guys help me out and (which they did really well) but I just wasn’t ready. I think it was just more a case of i'll be more ready than the rest of the team who have just flown out from Europe. There will be other chances and I'm looking forward to taking them. The race blew out, I missed some crucial cross wind splits but by the end of the week had some good sensations back in the pins and think I really got a lot out of the week. So far I'm more of more or less enjoying my time on the team, some of it is exciting, the prospect of working with the new trainers who have a big interest in my development, the camp in December truthfully was a hard pill to swallow. I enjoyed parts of it, but when its -10 degrees in Moena and it's 30 degrees in New Zealand with my friends and family I've seen for only 3 weeks in the last 9 months it wasn’t easy. That said I understand the importance of it and would not be wanting to start the season without having a productive month over there, more so off the bike than on. Change is good for growth. Put me outside my comfort zone and eventually your comfort zone grows far enough to make you comfortable again. It’s a chance to learn a new way of doing things, a new language and a whole new circle of people I would never meet with my rather reclusive set of anglo cycling friends. Although I've stepped into a completely foreign environment the people involved are great and that makes the difference.